This week’s SATURDAY SIX takes a look at Six Things Disney Can Take To the Dump Along With the Sorcerer’s Hat. With Disney now finishing up dismantling the Sorcerer’s Hat and taking it to the landfill, we here at the SATURDAY SIX offices figured it was a great opportunity to get rid of some other things we want to see removed from WDW. Since the jackhammers and dump trucks are already out, why not take advantage of them and get rid of some other unwanted items? The Disney Landfill. It’s kinda like the Disney Vault except when things get put in here they never come back out. (Picture taken by Matt Cleary using an ESPN phone. So we put on our thinking caps, looked around the entire resort, and are here to present to you the six things we think Disney should just wash their hands of, starting with…. If you have 30 minutes, a Disney Imagineer will explain to you the elaborate backstory to Chester and Hester’s Dino-Rama and why its gaudy and obnoxious appearance works wonderful within the otherwise gorgeous Animal Kingdom park. But just like a joke that you have to explain probably isn’t funny, a land that you have to jump through hoops to explain probably doesn’t work either. 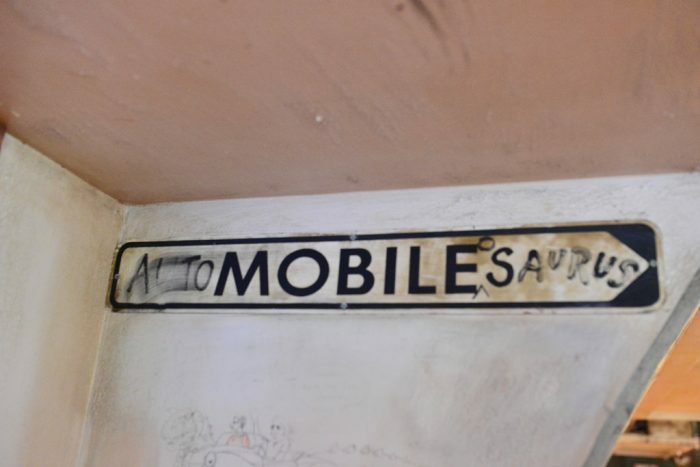 Let’s face it, Chester and Hester’s Dino-Rama looks cheap. Anyone who has worked in Hollywood will tell you it takes a lot of money to look cheap, and while Disney spent a lot of time and money developing Dino-Rama, it comes across like they just threw it in the park with no thought whatsoever. It doesn’t matter whether it is true or not, perception often becomes reality. Where Disney triumphs above all else is drawing guests into a land, whether it’s walking down Main Street or the subtle transitions from Frontierland to Liberty Square, guests feel completely immersed and everything just feels right. Dino-Rama is like someone dropped an anvil on your head. There are things to enjoy about Dino-Rama, and if this land were in any another place it would probably be lauded for its creativity. But this isn’t any other place, this is Animal Kingdom. Primeval Whirl and Triceratops Spin, two rides which you can find at your local state fair, in the same park as the elaborately themed Expedition Everest and Kilimanjaro Safari? 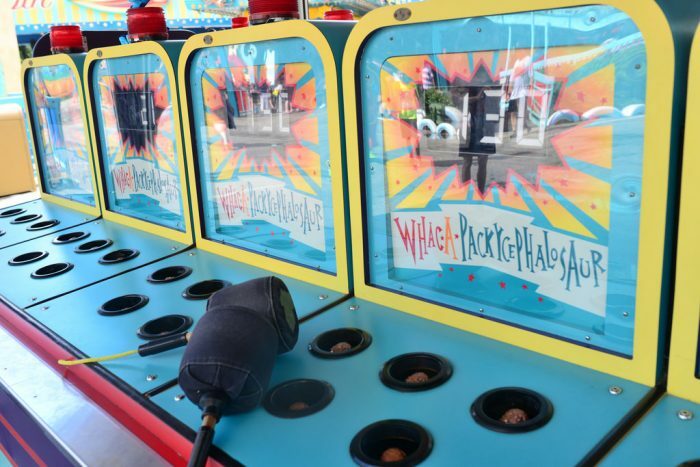 Cheap carnival games in a park that has Festival of the Lion King and Finding Nemo: the Musical? I don’t care that if this were the real world Dino-Rama is exactly the type of place that would pop up. This isn’t the real world. This is Walt Disney World, and it’s better than this. When it comes to an overall amount of quality theme park restaurants, Epcot stands alone at the top of the hill. Via Napoli. Le Cellier. Monsieur Paul. Teppan Edo. Restaurant Marrakesh. Tutto Italia. These are just the cream of the crop. You know you are doing something right when Rose & Crown and Sunshine Seasons don’t even rank in your top 10 restaurants. And then there is the Electric Umbrella. Electric Umbrella actually brings me back to the days of my youth, watching Sesame Street and singing the song “One of these things is not like the other.” While it is almost inexplicable that Disney guests go to the Electric Umbrella on an average day, it gets ramped up to the nth degree during Food & Wine, when even more – and better – choices are available throughout Epcot. The fact that the Electric Umbrella exists in Epcot is like having President James Buchanan on Mount Rushmore or our very own Len Testa inducted into the Rock and Roll Hall of Fame. Clearly there is a group of Disney Fans that need to be saved from themselves, so here’s hoping Disney just moves Electric Umbrella in the middle of the night and drops it off at any of the bland strip malls along I-Drive. With half of Disney’s Hollywood Studios already at the landfill (and they can’t bury The Legend of Jack Sparrow deep enough) it’s tough to justify the park losing something else, but there is absolutely no reason for the ABC Commissary to exist. Now that the park is not even pretending to be a working production studio, there is no need to have a restaurant “themed” (and we are using the loosest definition of that word possible) to a cafeteria you would find at a movie studio. The food is passable at best, and the huge seating area will have you wondering if Disney just forgot to put interesting things inside the restaurant. It is almost impossible to believe the same park contains the elaborately themed Sci-Fi Dine In Theater and ’50s Prime Time Cafe. With DHS transitioning to a more of an “adventure” park, now is the perfect time for WDW to just bite the bullet on ABC Commissary and Fix It! Last week we talked about the fact that we think that Disney’s BoardWalk resort is – top to bottom – one of the most impressively themed areas on property. It’s that good. However, if the only way to get rid of the BoardWalk Pizza Window meant losing everything else in the resort as well? Well, that’s a sacrifice we’d be prepared to make. Why? Because sometimes you have to burn a village to save it. We can all agree that, by and large, Disney pizza is bad, right? You can’t count Via Napoli, Splitsville, or Wolfgang Puck, all of whom have exceptional pizza, but none of them are owned by the Mouse. I also don’t think you can count the 1,000 new flatbread pizzas that Disney put into just about every restaurant on property. Those taste good, but that’s not traditional pizza. We’re talking the pizzas we all get at our local pizzerias, or in the frozen section of our supermarkets, or call to get delivered to our houses. That’s pizza. It is with a heavy heart that I write this, as Journey into Imagination was probably my all time favorite Disney ride growing up. I loved the Dreamfinder. I loved Figment. I loved One Little Spark. I loved everything about the ride. Now? 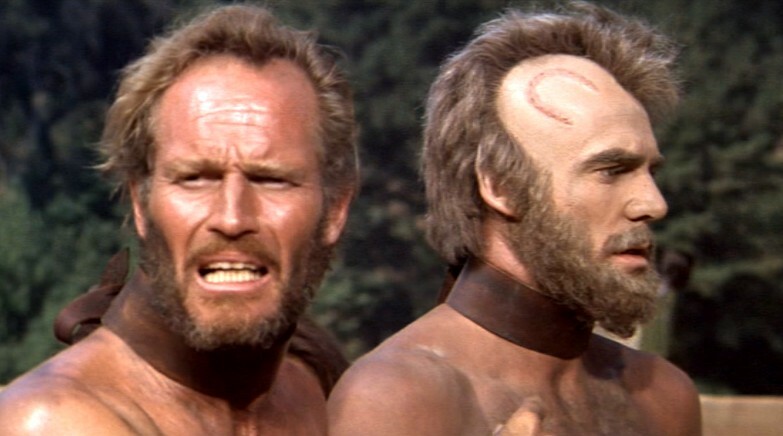 Now it’s like that scene from Planet of the Apes when Charlton Heston finds out his friend has been lobotomized. Journey Into Imagination with Figment ripped the soul out of the original attraction and replaced it with a cheap facsimile. Figment, a top ten WDW character, is completely wasted here and deserves better. The whimsical dragon is imagination personified; a character that encourages curiosity and discovery. Now he is reduced to cameos in scenes that have been dumbed down and aren’t that impressive to look at. There’s a reason this ride is almost always a walk-on despite an overall lack of attractions in Epcot. 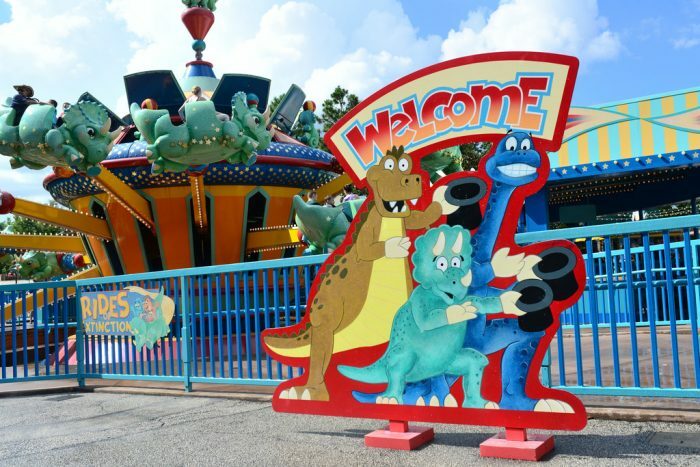 It doesn’t connect emotionally to anywhere near the degree the original did, and don’t get us started on what has happened to ImageWorks. Let’s hope in the coming years, after Anna & Elsa get their place in World Showcase and Soarin’ gets its third theater, Figment and the Imagination Pavilion will get some TLC and be restored to their former glory. Heck, maybe they’ll actually put some actual IMAGINATION into the next reboot as well, giving this generation the same type of inspiration I had as a kid. And while we’re at it, let’s bring back Dreamfinder! …but it’s far from good. Figment in this attraction is like watching Indiana Jones in the Kingdom of the Crystal Skull movie. Don’t worry Figment, it gets better. Where do we even begin? You can pretty much make a case of just getting rid of Tomorrowland in its current state, as even The Simpsons television show mocked how outdated it has become. However, no one can deny that Space Mountain is a still a great ride, Monster Inc. Laugh Floor is an underrated family gem, and with a simple retheming to Cars, the Speedway would become immediately relevant again. Stitch is a character Disney is going to shove down our throats whether we want him or not. The Stitch character is a great design, and his merchandise is sold everywhere. He is the John Cena of WDW (and a case could be made that Figment is the Daniel Bryan of WDW.) So it is no surprise that despite disastrous guest reviews, Stitch’s Great Escape has been chugging along now for over a decade. But enough is enough. This attraction stinks, period. If the Powers That Be demand that Stitch has to have a ride in the Magic Kingdom, then at least give him a good one. I will say up front that I am biased on this one. 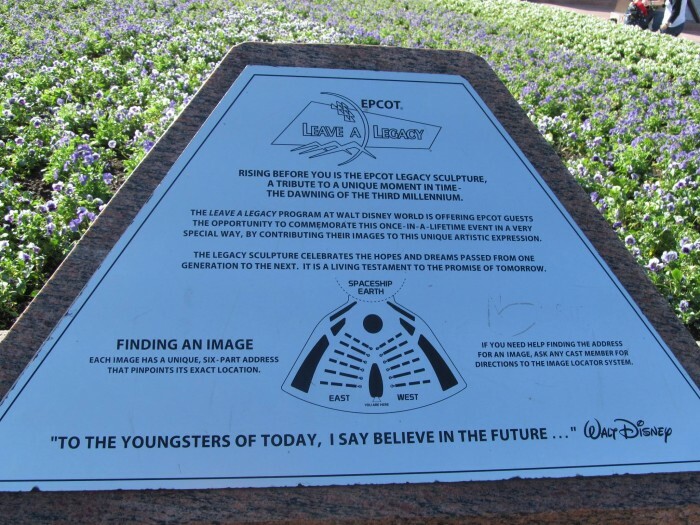 I have three family members who have tiles at Epcot’s Leave A Legacy, all of whom have now passed away. 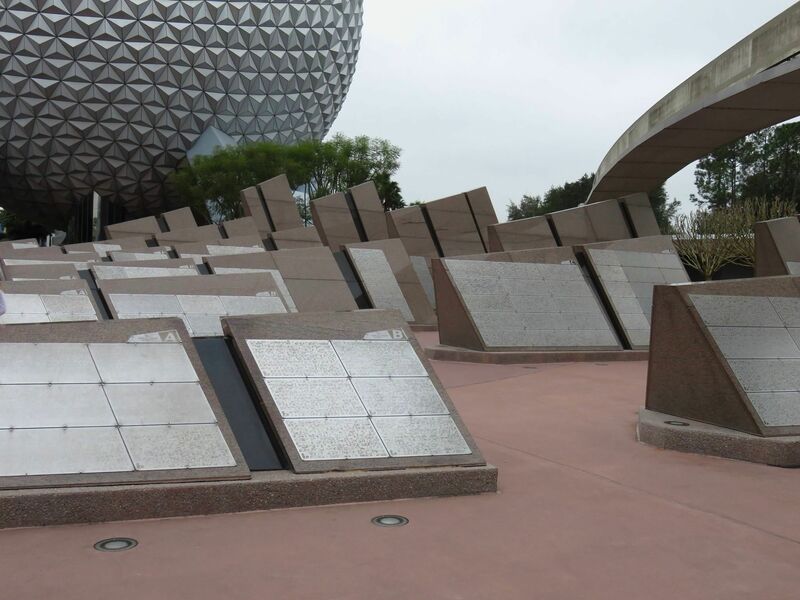 But I can not deny that these monoliths are something that a lot of WDW guests would like to see removed. Sitting directly at the front of the park, these structures have little use for anyone outside of the 500,000 or so people who bought one of the tiles. It would be like if movies went back to putting the 5-10 minute scroll of credits at the front of films instead of at the end. When you can skip something, you don’t mind it as much, but you can’t skip Leave A Legacy and you are reminded of its existence each and every time you walk into Epcot. So while I will not sign the petition to get rid of the monoliths, I completely understand the reasoning of those that do. Special thanks to crack staff photographer Brandon Glover, ‘Ohana foodie Tim Grassey, MASTER photo manipulator Matt Cleary, and Megan Stump for their invaluable assistance with this article. Be sure to also check out Brandon on The Park Blogger podcast with co-hosts Aengus Mackenzie and Brian Carey. This Week On TouringPlans YouTube Channel: Peter Pan, The Land, Tonga Toast and More! December 13, 2013 Guy Selga Jr. Comments Off on This Week On TouringPlans YouTube Channel: Peter Pan, The Land, Tonga Toast and More! You nailed it. At first, I found my feelings hurt when you dissed ABC Commissary. But the more I thought about it, the more I realized that, while I don’t have the level of disdain for ABCC you possess, I also wouldn’t miss it if it disappeared. Brilliant! We have a running joke about the electric umbrella in my family. It’s just terrible. We fell victim to the boardwalk pizza window on our last trip. All they need to do is figure out how to cook the crust, perhaps in an oven, and it would be a major improvement. Cooking the crust would help, but they also need to do something about the stringy cheese. I worked in a snack bar in a hockey rink in the late 70’s and I think the Boardwalk Pizza Window is using the same canned mozzarella! There was a Bar Rescue episode at a bar with bad pizza. John Taffer brought in a pizza expert to help them make a great pizza. But the mistakes they were making are even present at Mama Melrose which is supposed to have wood fired pizza as a specialty. Pizza crust must be STRETCHED and not rolled into shape. Eliminating the air bubbles will make the crust (no matter how thin) to be floppy when the other ingredients are cooked. Crisper crust requires the right dough preparation. They do the OPPOSITE. The flatbread pizza at least come with a pre-shaped crust that is frozen and ready to go. They don’t screw up the dough by messing with it. But obviously, the best pizza crust comes from fresh dough prepared correctly. 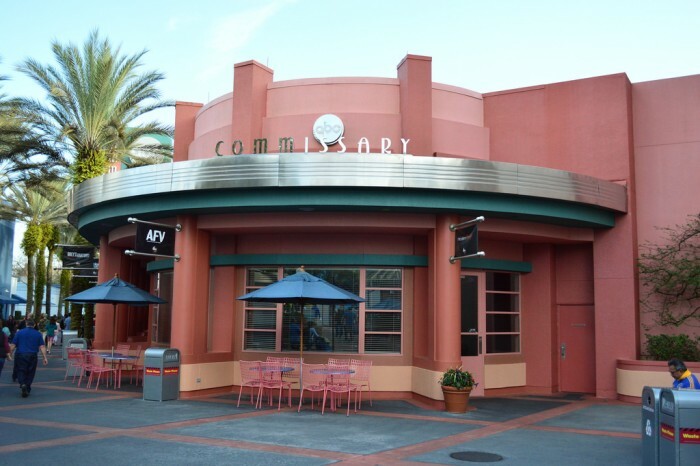 it would be great to see them turn the Commisary into some kind of Star Wars themed restaurant. I’ve never ridden Figment or Stitch. Definitely not on my list of must-dos at WDW. If they were closing the rides, I would probably go on them just for the sake of saying I did. I agree with Chester and Hester’s. What in the world were they thinking? AK could use the kiddie rides, but the theming is just weird. A Mos Eisley Cantina could be fantastic! Yes! I couldn’t remember the name. As always, a funny, thoughtful look at some aspect of “the World.” Even if I disagree with certain selections I am still laughing, and therefore more willing to consider that which I might otherwise consider unthinkable. Short version: there’s nothing wrong with WDW that a billion dollars invested here and there wouldn’t fix. But Disney is now answerable to stockholders, not guests. A rant for another time. Longer version: Tomorrowland was a great idea when first realized at DisneyLand and again at WDW. But now, even FutureWorld in Epcot can’t keep up with the present. Thus, we have a Tomorrowland of space travel and otherworldly creatures. And Indy cars. It either needs a new name or we need to understand “retro kitsch” is about as futuristic as it’s ever going to get. Maybe the new name can be “And the rest….” like the original Gilligan’s Island theme song. Captain EO and Ellen’s energy adventure top my list of stuff to get rid of. Hard for me to put Captain EO on the fast track to the chopping block when I think it is much better than its first replacement, Honey I Shrunk The Audience. At least the guys behind Captain EO tried. I’m with Mike E on this one. I can’t believe Captain EO didn’t make your list. Several seats in the theater are being held together by duct tape (not an exaggeration, we had to move seats twice due to uncomfortable tape placement), the film quality is beyond outdated, and the quality of writing and acting are terrible. Of all this things that should be torn down, this should be #1. You’re kidding us right? Disney was based on and still is a major set of film production companies. For them to even admit to owning this film, never mind featuring it as an attraction in one of their highly rated theme parks, is a slap in the face to all guests who think Disney cares about what they create. If they did care, they’d release a new film for this location at least once every decade. They can’t get rid of Captain EO soon enough! Please trash Country Bear Jamboree too. I know some people are attached for sentimental reasons but for those of us who are newer to WDW it does not belong in one if the world’s top theme parks. CBJ belongs at a Six Flags park. Wow, the Boardwalk is my favourite hotel on property but I always passed by the pizza window, figuring I’d rather eat somewhere in Epcot proper. Now I’m glad I did. I had no idea they were pushing the worst pies on property. I always hated DinoRama. Last visit I was there after dark. It actually had some charm at night. It is really quite cute with the lights. I think it salvageable. It also has the best playground on property according to my nephew. However, I keep trying to understand what they were thinking with Captain EO. But absolutely do not bring back Honey I Shrunk the Audience. What about a Figment 4D movie? They can’t get rid of The Boneyard playground. We take the kids’ picture on the dinosaur skeleton there every time we go. We have a photo series of them growing up on that dino. If they do trash Chester & Hester’s, I hope they still keep The Boneyard. I totally agree with everything. I cannot stand Stitch’ s Great Escape and cannot understand why, when you walk past there always seems to be people waiting to go on it. I can only assume that they are new to the ride and don’t know what they are letting themselves in for! Ah well suppose it wouldn’t do for us all to like the same things. Ummm, the reason to go into Stitch’s Great Escape is to watch the reactions of the adults and kids who have never been there before… It’s people watching at its best LOL. I completely agree with you that the Stitches Great Escape should be removed and honestly I think it should be returned back to its former glory of being the Alien Extra Terrestrial attraction. Yes! Alien Encounter was awesome. Stitch totally ruined it. I think the Boneyard is not officially part of Chester & Hester’s (although I could be wrong). I agree that it is one of the best playgrounds on property and our kids always seem to find extra legs to spend an hour there at the end of a long, hot morning. 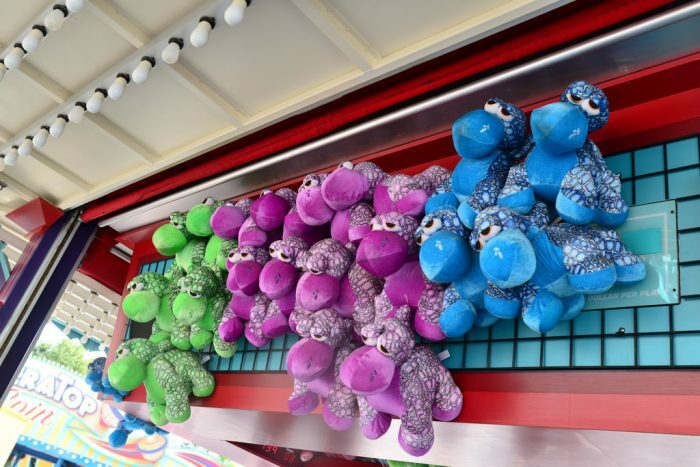 The arcade though, Primeval Whirl … yup, I think they should get trashed. I wouldn’t like to see Tomorrowland go away, although I agree that it seems like early Sci-fi that missed the real-life boat, that doesn’t keep it from having a cohesive and attractive theme. You forgot to mention TTA and that Buzz Light-Year is a good alternative for people who don’t want to wait hours for Toy Story Midway Mania. That said, you totally nailed it with Stitch’s Great Escape, it’s the only ride at Disney that I’ve ever walked out of swearing to never ride it again. I agree with most of these, but I have to give a shout out to Chester & Hester. My family enjoys this land, particularly Primeval Whirl. We rode it over and over and giggled and laughed the whole time. It was nice to find a favorite that we could ride as many times as we wanted. And I love the details, especially how the carnival is set up in an old parking lot. I just can’t see getting rid of the “leave a legacy” During our honeymoon, we got a free tile. We do not visit yearly, but when we do, I like to go to our picture and see it there. Call me sentimental. I’m with you Pam. There is very little in life that my mom loved more than Disney. She got a tile and loved seeing it. She passed away several years ago, but I still love going and reminded that a part of her is still there. I hope it’s not a horcrux…. If they want to plop that thing in the middle of Avatarland, they can count me in for $20 to help. Makes about as much sense as Avatar being in the Animal Kingdom to begin with. Alien Encounter was great. But despite warnings about it scaring the ahhh..socks off younger kids, parents still took their kids and then complained that they didn’t expect it to be scary. Same thing happens on Mission Space: Orange. For that matter the same thing happens with It’s Tough to be a Bug. I hope they never mess with that one because it’s my favorite of the 3D movies. Snow White’s Scary Adventure had “scary” in the title and people were still upset after riding. Some guests you will never please. Ever. Or if you do, it’s at the enjoyment expense of the other 99.44%. Sure Via napoli is not far from the electric Umbrella, but when you have kids who will only eat food in the form of a nugget and a hamburger, it is a the best choice in Epcot. I would love to eat a sunshine seasons, but my kids will eat nothing there. I have tried. Personally electric Umbrella is AWESOME!!!!!!!! Because of their SELF SERVICE soda. I probably shouldn’t post this on here, because if this location gets more popular, they’ll probably put the soda machines back behind the counter. Who cares if the food is exactly like what you’d get at the magic kingdom. It’s fine. Also, the food at the American pavilion is just as pedestrian when compared to other choices. There’s always somebody that orders chicken at the fancy seafood restaurant. I’d rather those people don’t clog up the line at a place I would prefer to be. That’s also another missing theme here: Disney should not be eliminating anything!! They should either improve, replace, or expand. I completely agree. When my kids were little it was nuggets or nothing so my only choice was the Electric Umbrella. Now that they are older we dont eat there as much but I do still appreciate the soda machine and it’s a nice place for a nap (which we took a short rest break there this past October). Saturday Sixteen? Don’t give the Grand Poohbah Len Testa any ideas. I’m looking at rebranding as the Tuesday Two or Thursday Three, maybe Friday Four. I have been and always will be a Disney fanboy, but Diagon Alley is AMAZING. I truly hope it force Disney’s hand to up the ante (too many poker idioms?). Avatar Land (or Pandora) better deliver the goods. If Universal succeeds in their plan to upgrade the rest of their parks with theming as rich as their Harry Potter properties, Disney better watch their backs. I can’t recommend Diagon Alley enough, and Hogsmeade is a close second. The rest of Universal, meh. They serve pizza at the Boardwalk Walk-Up Sangria Window? I just wanted to give a shout out to whomever the creative team was for the Disney Landfill mockup. That took serious effort and shows incredible detail. I encourage everyone to go back and really look at the individual images. It’s every bit as clever as The Beatles’ Sgt. Pepper album cover. It is both humorous and sad. Thank you! I give Matt Clearly a bunch of tinker toys, he comes back with a working scale model of Soarin’. He’s amazing. Thank you to Matt! And to you, Derek, for hiding another reference in your comment. In another life you must have been a bot on the Sattelite of Love. 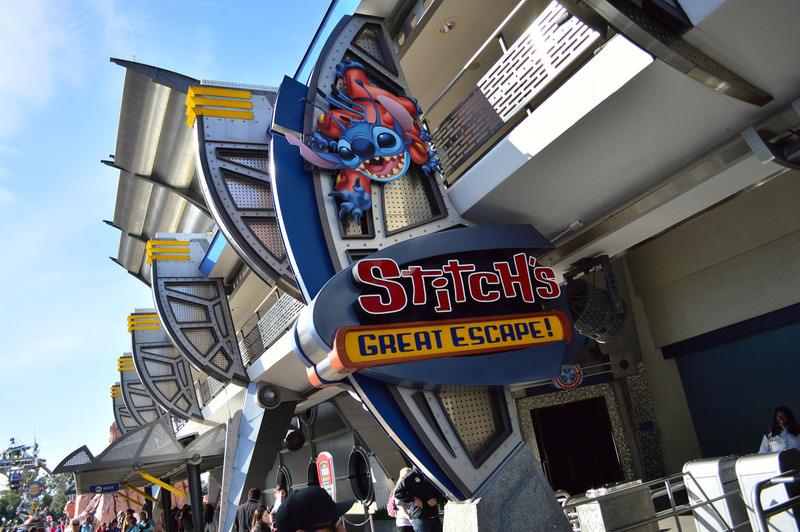 Stitch’s Great Escape: It is what it is, and I like it …but I’ll be happy when it’s replaced. Journey Into The Imagination with Figment: 99% agree, it wasn’t broken and didn’t need fixing. I’m on the side of start over and do it right, with Figment and Dreamfinder. Boardwalk Pizza Window: WDW took decades to get coffee right, and they had to outsource that. I will not hold my breath waiting for edible pizza. ABC Commissary: It has clean restrooms and it’s a nice air-conditioned place to sit. A big waste of real estate …which is getting to be an oft-repeated phrase for huge chunks of DHS. The Electric Umbrella: Every time I walk in there I feel like I’ve stepped back in time, to a Six Flags or Kings Dominion. That is not a good thing. Theming! Chester’s & Hester’s: The best thing I can say is the theming perfectly captures those cheesy James E. Strates Shows and other traveling summer carnivals. All that’s missing are gap-toothed carnys. Not that I want to encourage Disney to head even further in the wrong direction. It is a joy to read an article that responsibly (and humorously) raises valid questions about specific attractions and places without ever resorting to the “everything stinks” negativity found on a couple other Disney fan sites. Thank you. The pizza window is not the problem. It’s just bad pizza. They should just start making better pizza. That would be cheaper than a remodel, more revenue for them, and better pizza for customers!! But Boardwalk needs a proper counter service restaurant like beach club. Not just pizza. Pro tip — If you’re at boardwalk and walk to the Hess gas station, they have inexpensive food that the cast members seem to regularly eat. It’s regularly priced, and it’s probably better tasting than the pizza at the pizza window. Probably? No ifs, ands, or buts. It’s better. That’s a good tip because they have plenty of other snacks too available at Real World pricing. I was just wondering that, too. Come on, kids! Let’s go eat at the Hess! I wonder if I need to make an ADR? Can I use my snack credits to top off the tank on the rental car? I usually am driving around there anyway. If I’m going to get food quickly just for sustenance and a money saving option, the hot dogs at Hess are very good and fresh. The Hess by the TTC parking lot has more options including a full on Quiznos at “regular” prices (not inflated). I personally have eaten there several times, and they have my preferred coffee dunkin doughnuts (not Starbucks). The gas stations are not at all nice themed area. They’re just typical convenience store food (although it’s fresh and heavily trafficked). Some people make the mistake of going to the McDonald’s over by the All Star resorts only to discover that they charge at least twice the normal McD’s prices. The disappointment of the people that have walked over there from the All Stars is palpable. Great article! I’d love to add Disney kids meals to your list of items to dump. Get rid of the ‘kid’ choices and just offer smaller portions of the main meals in each restaurant. Are there really that many children who will ONLY eat mac and cheese and chicken nuggets? Given the option, yes. That’s why I don’t give my kids the option. “Find something to eat at Sunshine Seasons or don’t eat.” They always eat. The Dino-rama complaints make me sad. We love it there. We go to AK during a.m. EMH and go straight to the Safari, after which we go to Expedition Everest. Then head for Dino-rama. We usually stay there for awhile, and I don’t have small children. One year it was so dead there (probably due to everyone riding EE or Safari) that the CMs let my kids stay on Primeval Whirl continuously for 10-12 rides. Grandma loves the games. It is such a bright and cheery place and adorably themed, although I agree with it not fitting in with AK. I guess I’m the only person who misses Kitchen Kabaret? I totally agree with #2! Imagination Pavilion is totally bereft of any imagination. Made ever so much worse by the loss of such a great ride–I would give body parts just to be able to ride the original ride again–for real and not on YouTube. 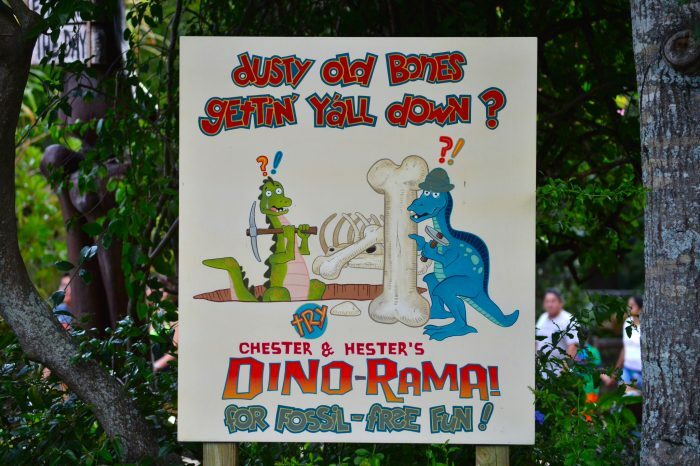 I can’t quite agree with the comments about Dino-Rama though! I love roadside attractions and totally “get” that area of the park, plus (and more emotionally compelling) my nieces rode the #e11 out of that ride, each taking 6-7 turns on it and love, love, loved it, mainly because there was no scary story element to it, which bothered them on other rides. Apparently that’s more scary to them than the spinning. I can’t believe no one mentioned Ellen’s Energy Adventure! Talk about a waste of valuable real estate! We keep expecting Disney to announce that they’re going to replace this long, boring excuse for an “attraction”. Can’t believe they haven’t at least revamped it to make it more interesting. Even if they just stopped the show after the dinosaur room, it would be an improvement. Ellen’s Energy Adventure is the top spot in our upcoming Top Six Places to Take a Nap in WDW.